Against a backdrop of blustery winds from the San Francisco Bay area and beautiful, cloudless skies, an estimated daily crowd of 100,000 gathered at Travis Air Force Base, Calif., to see the U.S. Air Force Thunderbirds put on their trademark spectacular air shows at the “Skies Over Solano” Air Power Expo July 30-31. Fellow NASA research pilot Hernan Posada and I were invited to represent NASA at the event, near Fairfield, Calif. We flew one of Dryden’s Beechcraft B-200 Super King Airs on a route that led us from our home base at Edwards over the snow-covered Sierra Nevada range and into California’s agriculture-rich Sacramento/San Joaquin valleys. Upon arrival Friday afternoon, the ramp was filling with a wide assortment of civilian and military aircraft, classic and current, as we met other pilots and aircrews from around the country. Our hosts, the 60th Air Mobility Wing, commanded by Col. James Vechery, held an evening BBQ mixer for performers and exhibiters at the wing’s air museum. Along with the terrific welcome – and appropriate safety advisories – Col. Vechery advised us that the proper response to hearing someone mention “Team Travis” was a loud, unanimous cry of “air power!! !” The 60th AMW operates three different types of aircraft: cargo-carrying C-5s and C-17s as well as KC-10 aerial refueling tankers. 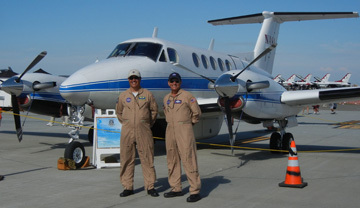 Image: Dryden pilots Hernan Posada, left, and Mark Pestana took thecenter’s Beechcraft B-200 to Travis Air Force Base for a meet-and-greetwith thousands of show-goers, many of whom the pair found were avid NASAfans. The next two days were filled with awesome exhibitions of aerial skills, ranging from gut-wrenching civilian aerobatics to ear-splitting military aircraft fly-bys. Even the U.S. Air Force Academy Parachute Team managed to maneuver to pinpoint landings in the gusty winds. Personally, our greatest thrills came from the visiting public, who eagerly greeted us with enthusiasm and excitement over the fact that NASA was there. Initial questions from the public centered mainly on the future of human space exploration. We reminded most that humans are living in space as we speak, and will continue to do so as we expect further developments in space exploration in the coming years. We also mentioned the proliferation of robotic planetary exploration that is continuing. Of course, our primary messages were about that first “A” in NASA, and how we’re heavily engaged in using aircraft for two primary NASA missions: research in aeronautics and in Earth science. In particular, our B200 display board showed how these aircraft are used for vital research, from testing a cave-detection sensor destined for a Mars orbiter to wildfire location missions. The most rewarding part of all of this was that 100% of the public’s response is that they are diehard NASA fans and want to see more and greater accomplishments in the future. Oh yeah – and handing out those NASA stickers and pins is always a crowd pleaser, too!